PictuRings and PictuCharms play with the idea of wearing our memories on our body. We cherish memories and we record our memories in photographs and by collecting objects as souvenirs. PictuRings and PictuCharms is a series of individual photo jewelry. 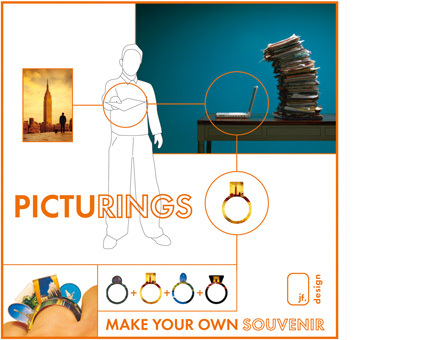 Choose individual rings and create your own memory / souvenir ring. Spread on the finger, you display the pictures, closed you keep them private. Add charms to your favorite necklace or bracelet or start a new one. Collect memories.